Teacher Michelle McManus, right, leads her students in her classroom in a fun greeting song during a recent Morning Meeting, a responsive classroom training tool she and other teachers use to make students feel more comfortable and accepted. 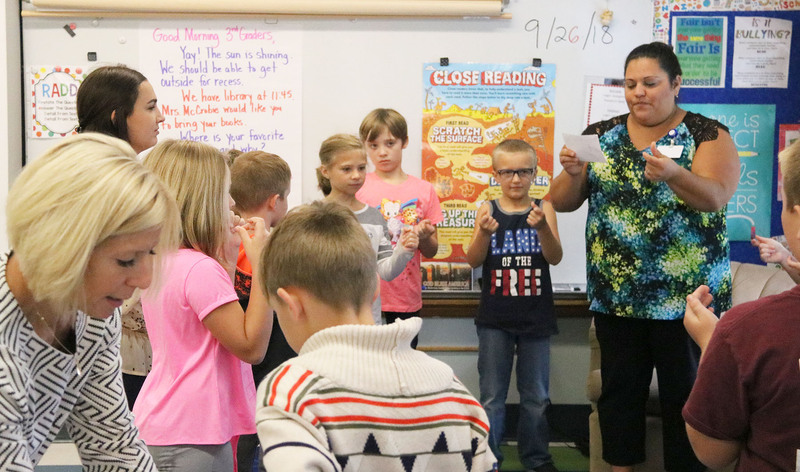 Community culture has been the foundation of each Leighton Elementary School classroom since the beginning of the 2018-19 school year. To create a sense of acceptance and belonging, Leighton teachers have implemented Morning Meetings each day, following a responsive classroom training workshop during the summer. Third grade teacher Michelle McManus said several of her students have latched onto the routine and have blossomed socially, emotionally and therefore, academically. Despite the struggles children may have at home and outside of school, McManus said, Morning Meeting is designed to bring everyone together and provide comfort. She said the natural outcome is a reduction in poor behavior/choices and a boost for their foundational and social/emotional skill-building. McManus said the academic component that is woven into Morning Meetings time has related to curriculum ques, such as: speaking in complete sentences, re-stating questions in responses and eventually speaking in paragraph form. All of those can also be utilized in writing lessons.